Thursdays bring Make Up For Ever Smoky Lash mascara which I received in my March TopBox (see review here). I do enjoy MUFE, having used their HD foundation, Aqua Creams, Eye pencils and Cream Blushes so I was stoked to receive their mascara. This sample size was perfect for me to test to see if I love it enough to buy the full size. I have to say I was extremely disappointed when I opened the package and took out the wand. The bristles were extremely gloopy and clumpy. The formulation seemed very dry and I was not convinced that this would apply to my lashes without significant combing of the wand and combing after. The wand is big, huge in fact. One of the largest wands I have encountered on this mascara journey. And it is the bristles as opposed to the rubber comb-like wand I favour. I just couldn't get past the clumpiness. As I suspected, I had to use a comb - a lot - to remove clumps and separate the lashes. That said, I only had to comb after the first coat, subsequent coat did not require combing. The lashes do add to a smoky eye, that I do not dispute. The lashes get dark and sultry (lol). 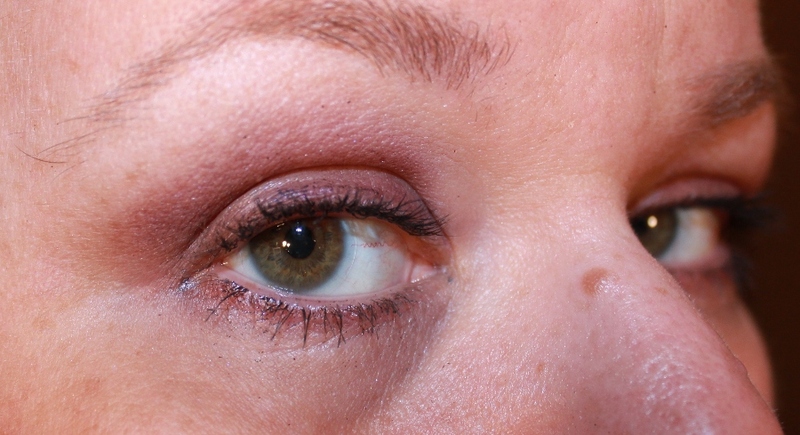 Above is a picture of the clumping of the lower lashes pre-combing. Damn hound dog look rares it's head again! The mascara leeched and flaked down under my eyes and near my lashline on top. End of Day rating: Boo. So disappointed... Would I buy? Nope, sorry. There are far, far, far better mascaras available that a) provide the smoky and intense lashes; b) don't clump and require this type of additional work and c) cost similar or less monies.